Thanks for visiting the PeopleSoft Wiki (www.peoplesoftwiki.com). 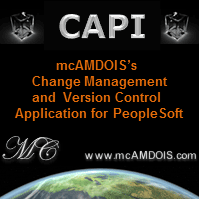 I started this wiki as a place to collect and maintain the knowledge I've gained as a PeopleSoft Consultant. However, instead of keeping all that knowledge to myself, I thought I would share it with everyone. My goal is to build a PeopleSoft community through this site and to have people all over the world contributing and sharing information. I hope you enjoy the site and find something useful here.